This impressive square-shaped farmhouse dates from around 1340. 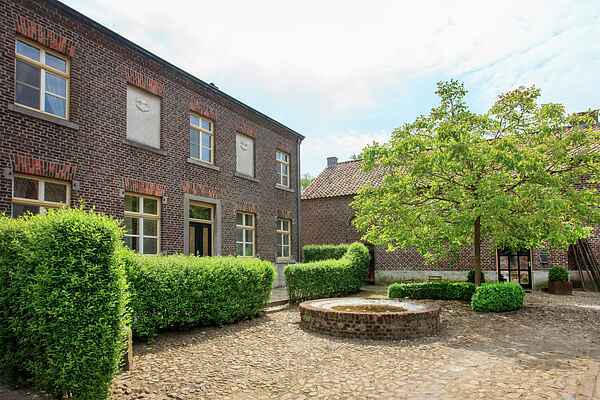 The farmhouse is in a rural area between the towns of Roermond and Weert. The group house consists of two parts, the Backhuis and the Hooge Huys. Some of the bedrooms and bathrooms are on the first floor of the Hooge Huys. All other rooms are in the Bakhuis, next door. The Leudal Nature Reserve with its beautiful broad-leaved forests and winding brooks is within walking distance. The famous Maasplassen area's beaches and water sports are just a cycle ride away. This accommodation is suitable for families and friends getting together, meetings and courses. Cookery workshops and catering would also be possible in the farmhouse. Please note: A service package containing kitchen linen, toilet paper, kitchen rolls, washing-up liquid, a cleaning product and coffee filters will be ready for you upon arrival. The service package charge of 32.50 is payable at the farmhouse.